If you are new to @ECGclass, before we start, you may like to read this brief explanation of what it's all about: #ECGclass and how it works. Each 'term' is spilt into 5 cases, launched a 2 weekly intervals. This weeks case is brought to you by Sy. This is a case for everyone it could be an out of hours call, walk in centre, GP surgery, ambulance or emergency department. History: A 35year old female brought in by a friend/seen at home. She report increasing pain in her back and shoulders for the past two days. Drugs: Amitriptyline (25mg ON), Paracetamol (1g QDS), Zomorph (10mg BD), Salbutamol inhaler (PRN). Neuro: GCS: 13 (E3, V4, M6). Our patient is responding to voice. No lateralising signs. This is a young person with hypotension, tachycardia and a mild tachypnoea as well as an acutely altered mental state. This is an unwell person requiring close monitoring and urgent attention to stop further deterioration. At this point we are unsure about what is happening so as soon as possible we would ask for general bloods, blood cultures (think sepsis as pulse>90 + acutely altered mental state ? pneumonia due to the decreased sats), ECG and a blood gas. Hopefully we can all agree that there is organised electrical activity and we already know this lady has a pulse, so we dont need to start CPR. The ventricular rate is around 100, regular and slightly widened (about 3.5 squares or 0.14 seconds). We have already asked for bloods and hopefully the gas will have come back with electrolytes on it. This ECG shows P waves visible as a blip in the T wave Lead II and V2. The P wave ratio to QRS complex is 1:1 so no 2° or 3° block (it is also highly unlikely that a tachycardic person has a 3° block). The Pt has 1° block, although we should compare this with old ECGs, if available, as this may not be pathological. We have a tendency to look at potassium as the main cause of cardiac arrhythmias, it is important not to forget the other electrolytes that alter cardiac action potentials. Hypokalaemia = T wave inversion & predominant U wave. Hyperkalaemia = peaked T waves. Hypercalcemia = short QT interval. Hypocalcaemia = long QT interval. Magnesium tends to mimic potassium, so hypermagnesia looks similar to hyperkalemia. Although magnesium disorders are considered rarer than potassium disorders. Generally have minimal ECG changes. Looking through the patients drug history there are a number of drugs that could cause the decreased level of consciousness. We have Zomorph but this is unlikely to leave a resp rate of 18 and 4mm pupils. Salbutamol should have relieved the wheeze, but would explain the tachycardia but not the ECG. A paracetamol overdose (OD) taken a few days ago and now presenting as liver failure could cause most of these symptoms and unfortunately it is likely to be too late for this lady. A late presenting patient with significant paracetamol OD is likely to die unless they are incredibly lucky and a liver for transplant happens to be available. This patient requires ICU admission due to the high risk to her airway because of the decreased level of consciousness and the likelihood of vomiting, the respiratory risk due to likelihood of seizures and a wide QRS tachycardia. 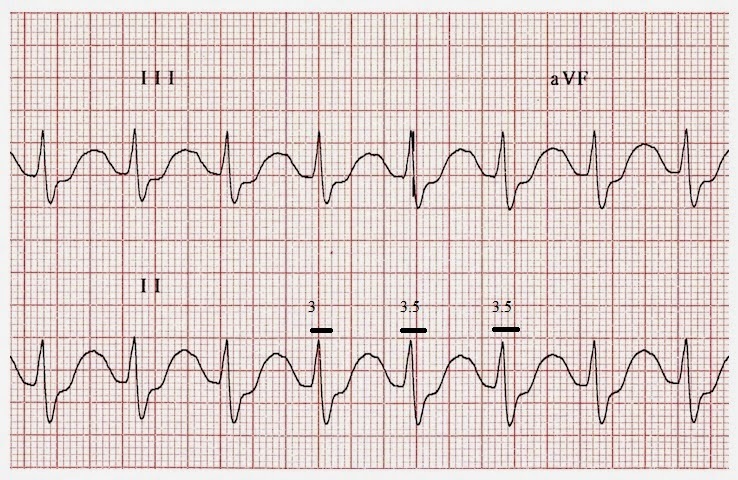 Those who look through the advanced life support tachycardia algorithm will have noted that this is a person with an unstable wide QRS tachycardia that, according to the algorithm, would initially be treated with DC cardioversion then 300mg amiodarone over 10-20 minutes then 900mg over 24 hours. 3 attempts at cardioversion are unlikely to make any difference to this person, the amiodarone may help to stabilise the cardiac action potentials, however this is one of the rate cases where sodium bicarbonate is indicated in large quantities. Sodium bicarb 8.4% should be given in 50ml boluses until either the blood pH is 7.5-7.55, or the QRS complex narrows. As sodium bicarb can increase intracellular acidosis this is another reason for the ICU admission and close monitoring. Diagnostic ECG features of TCA overdose. Inter-ventricular conduction delay and a right axis deviation. If no bundle branch block, in a supra-ventricular rhythm, and no sign of left ventricular hypertrophy consider TCA overdose and hyperkalaemia as the most serious causes. For once the aVR lead saves the day. An rSR' complex is suggestive of a problem with sodium channels - seen in Brugada and TCA/sodium channel blocker OD. This is based on an incident I saw at work with a patient who had poorly controlled neuropathic pain. They had been increasingly using there morphine to control the pain, until they remembered that the AMT they were taking was also for pain. They started upping the AMT and eventually ODd and were brought into resus and then to ICU. The patient had not discussed the increasing pain with there GP. The GP had spent a long time talking to them about the dangers of morphine in OD but had not spent so much time discussing the AMT or paracetamol. It is important that we educate our patients about the side effects of the medication we are giving to them. This is particularly important for medication the patient will be taking at home away from our sight. Final ECG Class for the Summer. GCS: 13 (E3, V4, M6). Our patient is responding to voice. 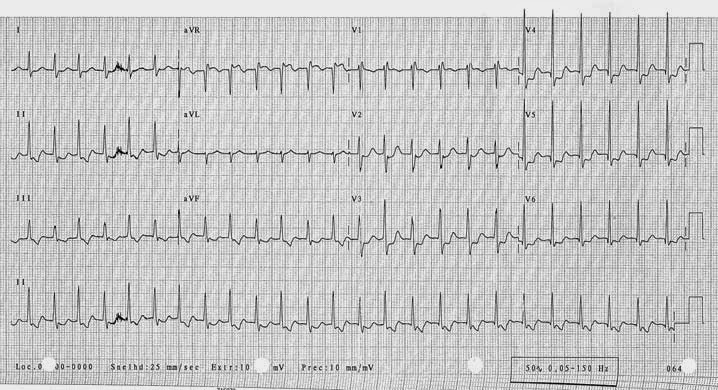 Welcome to this week's #ECGclass, authored by @J_vanOppen. Please use the hashtag #ECGclass if joining in the live and interactive Twitter discussion. A 33-year old woman, Mrs N, presents to your surgery complaining of “a wobbly chest”. She has been experiencing these most weeks over the last year and is concerned that her symptoms make it hard to concentrate while working as a primary school teacher. 1. Before you power-up the ECG machine, is there anything you’d like to ask or do? While exploring her history, you clarify that during these episodes Mrs N feels her heart “beating hard against her chest, and far too fast.” There do not seem to be any particular triggers, with the episodes starting suddenly both on exertion and at rest and stopping after several minutes. She does not appear to have any associated symptoms – she never experiences dizziness, chest pain, or shortness of breath. 2. What does this ECG show? Let’s use a sensible approach of rate – rhythm – axis (2.5 minute demo here: http://www.youtube.com/watch?v=nSDQ6hqggoM). Anything to worry about here? Rate: about 80: divide 300 by the number of big squares between R-wave peaks. Rhythm: first degree AV block: p-waves precede each QRS complex, but the PR interval just exceeds 0.2sec (1 big square). This wouldn't explain our patient's palpitations so is probably an incidental finding. Axis: normal: leads I and aVF both point up and R-wave transition occurs at V3. Overall: reassuring ECG. Not pathological. 3. What’s going on here? What has changed? Rhythm: Supraventricular tachycardia: this gets tricky. Firstly we can exclude a ventricular tachycardia as the QRS complexes are narrow. There are p-waves, but these are abnormal, are inverted, and appear after the QRS complex (look at the first half of the rhythm strip – they appear in alternate beats. In the second half, they appear every beat). Axis: normal: R-wave transition at V2. This is Atrio-Ventricular Node Re-entrant Tachycardia (AVNRT). AVNRT can occur at any age, but is more common in younger adults affecting around 1/1000 with females affected 3:1. The defect is a division of the AV node, which is thought to be an acquired abnormality. Two pathways are present – a slow (with a short refractory period) and a fast (with a longer refractory period). Most of the time, the atrial depolarisation wave follows the fast pathway and spreads through the ventricles via the Bundles of His, producing a normal ECG. Now, should a Premature Atrial Complex (PAC) arrive at the AV node too early while the fast pathway is still refractory, the depolarisation wave must instead follow the slow pathway, after which it can track back up the fast pathway towards the atrium, thus forming the re-entrant circuit. 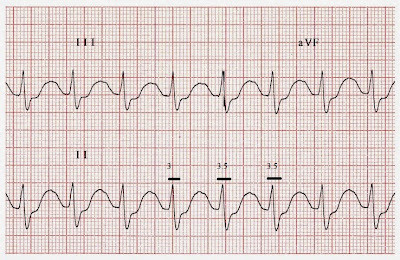 This retrograde depolarisation is the cause of the inverted p-wave, which is obscured or occurs just after the QRS complex. 5. How would you manage Mrs N’s palpitations? Vagal-stimulating techniques can terminate AVNRT, and some advocate teaching patients the Valsalva manoeuvre or carotid sinus massage (one side only…). Adenosine is first-line for pharmacological termination of AVNRT. DC cardioversion is very rarely required in AVNRT. Beta-blockers, calcium channel blockers and digoxin have roles in preventing recurrence, but in this lady’s case care should be taken that these drugs do not potentiate her first-degree heart block (though it’s probably worth investigating whether this was transient…). The diagnosis of AVNRT could be confirmed by a minimally-invasive electrophysiology study, and the re-entrant circuit could be permanently corrected using radiofrequency catheter ablation to destroy the slow pathway. This would typically be offered to patients with frequent episodes or for who drugs do not work or are not tolerated. The cure rate is greater than 95%. Thanks to ECGpedia for the images.